Storybook Cottage Designs . . . The Fabulous Cottages of Blaise Hamlet! The Fabulous Cottages of Blaise Hamlet! The storybook cottage designs featured here are among the finest in the world. Now more than 200 years old -- and counting -- they are as charming today as the day they were constructed! 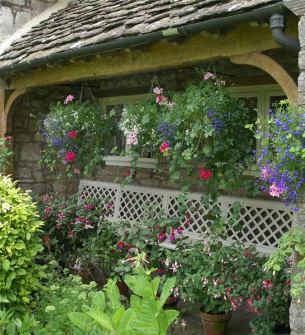 When it comes to storybook cottage designs, few, if any, do it better than the Brits. Their uncanny ability to blend a series of architectural elements to form a unified whole that exudes romance and nostalgic charm is indisputable. And nowhere have they done it better than at Blaise Hamlet -- the epitome of romance of a bygone era! Blaise Hamlet is like no other. It's a "secret" little hamlet of picture-perfect cottages in northwestern England. Begun in 1809 and continuing for a few years beyond that, the cottages were built for retired employees of wealthy merchant and banker, John Hartford, who owned Blaise Castle House -- an 18th century mansion house and estate near Henbury in Bristol, England. The Gothic style "castle," pictured above, left, was built in 1766. 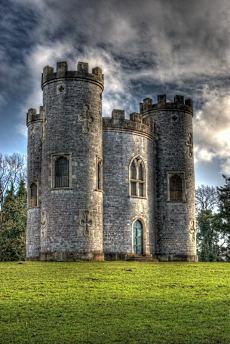 Although referred to as a folly, it was inhabited well into the 20th century with sumptuous interior decoration. Designed by architects John Nash (1752-1835) & George Repton (d. 1858), the enchanting cottages of Blaise Hamlet (pictured below) -- now owned by England's National Trust -- are laid out around an open green. Though, with the exception of one, they continue to be occupied, they may be viewed from the outside by the general public. "Rose Cottage" is now a holiday cottage rental. Pictured at right and below, left, is "Circular Cottage." Featuring a lovely thatched roof, it is one of the most photographed cottages at Blaise Hamlet. The charming cottage to its right in the image below is "Sweetbriar Cottage." It features a stone tile hipped roof. Pictured at right is "Dial Cottage." It is constructed of random rubble stone and brick, with stunning brick chimneys in a herringbone pattern. The charming cottage pictured below is "Oak Cottage." It is constructed of random rubble stone with brick chimneys and a thatched hipped roof. Pictured at right is "Dutch Cottage." It is constructed of random rubble stone with brick chimney stacks and a thatched gabled roof. The cottage in the photo below is "Diamond Cottage." It is constructed of random rubble stone with brick chimney stacks and a stone-tiled hipped roof. Both of the storybook cottage designs featured here have stone-tiled roofs. Pictured at right is "Rose Cottage," constructed of random rubble stone with brick chimney stacks and a hipped roof. It is currently available as a holiday cottage rental. The cottage pictured below is "Vine Cottage." It is constructed of random rubble stone with beautiful brick chimney stacks and a half-hipped roof. 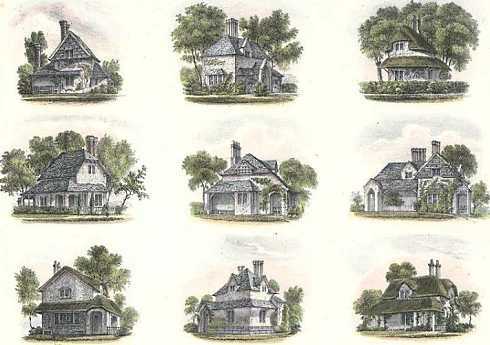 Pictured at right and below is "Double Cottage," one of the larger storybook cottage designs at Blaise Hamlet. It is constructed of random rubble stone with magnificent brick chimney stacks and a stone tile cross-gabled roof. And last -- but far from least -- is the Dairy House at Blaise Castle Estate, pictured below and in the vintage photo at right. Nearly as lovely as the storybook cottage designs at Blaise Hamlet, it also features a thatched roof. Please check back often or subscribe to our RSS feed, as we frequently add new images of storybook cottages to our site.